India is an incredibly diverse country for scenery and wildlife, containing steamy jungles and rain forests, large deserts, wide open plans and vast tracts of remote, unexplored mountains. In terms of safaris, India has a number of destinations that will give the enthusiastic wildlife spotter a lot to get excited about. Whilst India doesn’t have the density of large mammals on display that you can find in parts of Africa, it does have some unique species that you simply can’t see anywhere else in the world. Tourism is fairly well developed in India too, with a number of safari lodges and safari tour companies laying on “traditional” African style safari experiences, albeit with an Indian twist. 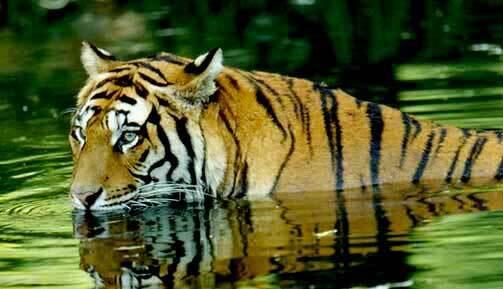 With over 360 species of mammals and 1,200 bird species, India has one of the richest biodiversity counts in the world. The signature species of India are tiger, leopard, elephant, rhino, bear, buffalo, monkey and antelope, all of which roam the central and southern plains. These animals are complemented by lions in a couple of Indian national parks in the east, where you can see lions, tigers and leopard coexisting if you’re particularly lucky on your safari! Further a field, if you fancy a mountain safari the Himalayas are home to the enigmatic snow leopard, yaks, blue sheep and the two humped camel. As such it’s no surprise that India as a wildlife spotting destination has really taken off in the past couple of decades, making it a credible alternative to a safari in Africa if you want to try something a bit different. Despite such riches of wildlife, habitat destruction and conflict with humans is becoming an increasing problem, and one which the government is trying to tackle by creation of more protected areas and national parks. Existing national parks in India tend to be out of the way with poor infrastructure and roads to get there. Pubic transport is often not an option, though you can get to the nearest town and take a taxi or auto-rickshaw from there to the park. Most hotels near national parks will be able to arrange transfers to the park, where you’ll be able to organize a jeep tour (or elephant, boat, walking, camel etc.). Bear in mind that the price of a safari arranged at a national park are one of the few things in India that are non-negotiable, and are generally higher for non-Indian residents. Ride an elephant out into the Brahmaputra floodplains to get up close and personal with families of Indian one horned rhino in Kaziranga National Park, Assam. Take a tiger safari to try and spot an elusive huge cat in one of India’s premier national parks – Bandhavgarh, Corbett, Ranthambore or Kahna. Explore the swamps and wetlands of the Sundarbans National Park, a UNESCO world heritage site that’s home to the world’s largest tidal mangrove forest, a unique culture…and the Bengal tiger. The best time to go on safari in India will vary according to where in the country you’re planning on going. Generally speaking India has three seasons – the hot, the monsoon and the cool, with the time each season starts and ends depending on how far north or south you are. The cool season is the most pleasant time to visit India, and starts once the monsoons finish, running from October to January. From February onward the heat starts to rise across the country, with temperatures in some places reaching 40 degrees by May. June is monsoon month, starting with high humidity and short electrical storms. These storms morph into intense daily rains with short breaks where the sun breaks through and steams the wet conditions into something akin to a turkish bath. For safaris, the hot season offer the best wildlife viewing as water is scarce and animals congregate around water holes as vegetation dies down. The later in the hot season you can go, the better for wildlife spotting, but this needs to be balanced with the growing heat through the season. A couple of other things to bear in mind when considering when to go on safari in India are holidays and festivals. Christmas and New Year are extremely busy times for tourism in India, with full national parks and hotels requiring reservations well in advance. And while festivals happen all the time across India, there are some – Diwali and Holi in particular – that can make for travel chaos nationwide, so do your research on which festivals are happening when and where, and plan ahead accordingly. In many parts of the country India is heavily focused on tourists – both internal and inbound. Towns and villages around popular national parks tend to have the full host of safari accommodation – from$5 rooms to ulta-chic safari lodges that (occasionally) replicate the real thing in Africa. Most lodges have good restaurants on the premises, though you’ll only find decent standard western food at high-end accommodation, and even then it’s pot luck. India caters to just about every type of tourist imaginable, and there’s a huge selection of safari tour companies that can arrange safaris locally, regionally, nationwide or even internationally (primarily into Nepal). It’s well worth shopping around and doing thorough research before committing to a particular safari tour company in India, as the quality of service varies dramatically. As a general rule you get what you pay for, and most prices can be bartered down at least 20%. Have a read of our reviews of safari tour companies in India. Have you been on safari in India? We’d love to hear your thoughts or suggestions! Please get involved in the comments below.